California Consulting Statewide Senior Director Holly Bachman attended the San Gabriel Civic Alliance (SGVCA) 8th Annual Luncheon on April 5, 2018. About 120 business leaders across the San Gabriel Valley attended this wonderful event. Pictured L to R - Artesia Council Member Ali Taj, California Consulting Statewide Sr. Director Holly Bachman, Los Angeles County Board Supervisor Janice Hahn, and Ed Rendon, Chairman of SCVCA. - California Consulting, INC.
California Consulting Statewide Senior Director Holly Bachman attended the San Gabriel Civic Alliance (SGVCA) 8th Annual Luncheon on April 5, 2018. About 120 business leaders across the San Gabriel Valley attended this wonderful event. 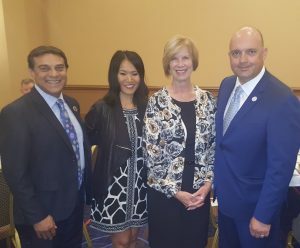 Pictured L to R – Artesia Council Member Ali Taj, California Consulting Statewide Sr. Director Holly Bachman, Los Angeles County Board Supervisor Janice Hahn, and Ed Rendon, Chairman of SCVCA. Assemblywoman Blanca Rubio, Assemblyman Adrin Nazarian, California Consulting CEO Steve Samuelian, and Senator Steven Bradford at the Armenian Caucus Reception held in Sacramento on April 2, 2018.